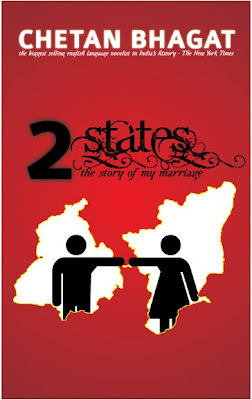 People have told me that Chetan Bhagat has outdone himself in his new book “2 States-The Story of my Marriage”. I wouldn’t know about that. This is his first book I read. But I do know that he has done an absolutely outstanding job in dissecting the psyche of the modern day Indian middle class family and brilliantly narrating in fiction the very real issues that people go through when inter caste/creed/religious/state marriages take place. Relationships are built. Lives are turned upside down. Humongous efforts are made to bring about even a semblance of acceptance. Relationships are broken. Sometimes they stay broken and sometimes (thankfully) things get sorted out and in the end love triumphs, as Bhagat’s characters in 2 States witnessed. The book very cleverly begins with the protagonist of the story – a Punjabi boy called Krish Malhotra, in a shrink’s office, doing a class Devdas act, trying desperately to come to terms with the apparent loss of the love of his life- a Tamilian Brahmin girl called Ananya Swaminathan. It then goes into flashback mode, where the love story begins “where all love stories begin”- with Krish and Ananya meeting for the very first time at the mess counter of the IIMA, where they both are fellow student-each with ambitions of their own and the ambitions driven by their own reasons. Krish, who shares a horribly impaired relationship with his father, also has to deal with an overprotective overzealous mother, who wants him to marry the first Punjabi girl that comes his way, strapped with a fleet of cars, house and money as dowry. The Malhotra family is as dysfunctional as any family can get, with Mr and Mrs Malhotra on non-speaking terms, Mr Malhotra with a fiery temper and unhindered rage and Mrs Malhotra’s large numbers of interfering relatives. The vivacious and bold Ananya on the other hand, comes from a typical conventional, well educated and education hungry Tamilian Brahmin family in Chennai, completely contrasting to her rebellious, outgoing, personality. Born to a quiet, reserved father, she is closest to him, while she and her mother share a frustrating albeit interesting relationship. She also has a bookworm of a sibling, whose only aim in life seems to be to become more of a bookworm and possibly graduate from the top ranking institutions in the country. Amidst tumultuous family issues, irate professors, truckloads of study material and raging hormones, the two meet, fall in love over many conversations, study periods, chicken and lots of chai. As they graduate and accept their respective placements, their relationship progresses to one of complete commitment but corresponding non-acceptance from the respective families. Bhagat then plunges into knitting and weaving his way through their respective lives and the various attempts they both make to please the other’s family. After lots of emotional upheavals and a breakup, he wonderfully gives the story a turn that I definitely wasn’t expecting. Suffice it to say, the novel ends in a happy Tamil-Punjabi marriage-a freakish North meets South scenario, which brings a warm feeling to the heart and a smile to the face. As an author, Chetan Bhagat has taken risks with some language that may not go well with the oldies, but then the book is aimed at the youth of India anyways. And they relate to him. He has fast become a youth icon and his attempts to bring about a change in the narrow mindset among our people, his entreating to young Indians to marry outside their caste to promote the feeling of Indian-ness and not be bound to one’s own caste, promises some very positive change in the county. Based on his own life, Bhagat has been fairly brave by not restraining himself in his assertions about the sexual romps of youth and his sarcasms about the Punjabi and Tamil communities, as well as his own parents, in-laws and Citibank (hahaha). But this is the very reason for the original story which has a genuine, honest touch to it. That is something every reader appreciates. To sum it up, I can safely say that once I picked up the book, I could not put it down and read it at one go. I now hope to read his previous works -Five Point Someone, One night@the call centre and 3 mistakes of my life-all of which made him a bestselling writer. Carry on Chetan! Your faithful audience awaits.